These wraps can revolutionize your food world. They’re a great choice for purists who don’t want to use any Frankenfood, or low-carb wraps from the store, but they’re easy enough for any Drive Thru Sue to master. See the Recipe Notes below for “practice makes perfect” tips… It’s a great idea to make the family-size batch every week, and keep them in your fridge (put teenagers or older children to work—we have teens who are better than we are at this now). Wonder Wraps make fast, no-think lunches for home or work, and they are sturdy enough to hold up well when stuffed with meats and veggies. For instance, it might be as simple and quick as stuffing the wraps with diced avocado and tomato. Or, you can create wonderful whole meals found in the THM cookbooks like “Wonder Fish Tacos”, “Enchilada Wonder Casserole”, or “Wonder-Wrap-Ful Lasagna”. Whisk together all the food ingredients in a bowl. Allow the batter to sit for a few minutes. 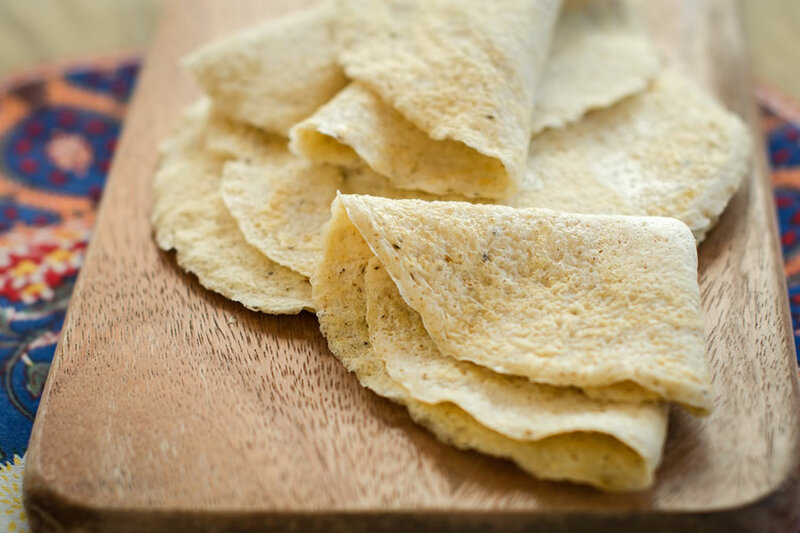 Put 2 rounded tablespoons of batter on the heated griddle and immediately spread it as thin as possible, using circular motions with your spoon until it resembles the shape of a wrap or a medium-size tortilla. Cook, turning over after the first side is golden, and continuing to cook the other side until very lightly golden. Continue to make more wraps until the batter is used up. Concerning “practice makes perfect”… Don’t abandon this if you (or your teen) mess up a little on your first attempt - practice makes perfect. The key is to spread them out as thin as you can on your griddle, using the back of your spoon. Don’t keep them thick, or they’ll be like rubber wraps, and nobody wants that. At first, make only one wrap at a time. Once you become a Wonder Wrappin’ expert, you can make two at a time to build your stacks of wraps faster. Watch the Wonder Wrap video we have on our website, if you need visual instruction on how to make these. We also give lots of ideas on what to fill them with. Concerning the serving size… If this is not enough for those with heartier appetites, you can up the single-serve recipe to 1 tablespoon psyllium with 1⁄2 cup egg whites and still easily remain in FP-mode.